Let Me Share With You How Our Specific Chiropractic Treatment and Therapies Can Relieve Your Auto Injury Pain Fast! No Up Front Out Of Pocket Costs For Personal Injury Cases! There are 5 major injuries that occur from auto accidents according to the insurance research council: fractures (2%), concussions (11%), nerve compression and/or irritation (16%), disc herniations (25%) and spinal ligament injuries (87%). Standard X-rays, MRI and EMG/NCV are accurate tests for the first four injuries, however these tests DO NOT reveal spinal ligament injuries. It is not uncommon to be injured in an auto accident and leave the ER or other medical facility being told tests are negative, you simply have a sprain/strain soft tissue injury and to simply take some anti-inflammatories or pain medication. If it is a grade I ligament sprain you will more than likely heal quickly without much treatment being necessary. However, without proper biomechanical testing, there is no way to determine if the ligament tear is a Grade I (transient irritation) vs. a Grade II (partial tear) or Grade III (complete tear) of the spinal ligament. Many people suffer with ongoing chronic neck pain, headaches or back pain after an auto accident after which they were told all the standard medical tests were negative. Ligament tears do not heal, they wound repair with scar tissue and without proper diagnosis and treatment in a timely manner may leave the patient with permanent pain and even a 25% whole body impairment according to the American Medical Association. Dr. Packer is credentialed in spinal biomechanical engineering, crash dynamics and medical-legal documentation to properly diagnose, treat and document your auto injuries. Dr. Packer has served as a credentialed expert witness multiple times in personal injury cases in General District and Circuit Court cases. Don’t let your injuries go undiagnosed and turn into permanent problems. A thorough exam including biomechanical imaging can prevent pain, muscle spasms and living with restrictions to your activities of daily living after an auto accident. Automotive accidents can cause damage to soft tissues not easily diagnosed without a specialist. Many common treatments involve pain medication and muscle relaxers. While these treatments may temporarily alleviate neck pain and back pain, the underlying cause of your neck pain or back pain requires precise and delicate adjustments to properly realign your spine. Precision Spinal Care in Chesapeake, VA is the only local NUCCA treatment clinic dedicated to non-evasive and precision adjustments to align your spine and correct the source of pain. In most cases, we remove your need for pain medication. 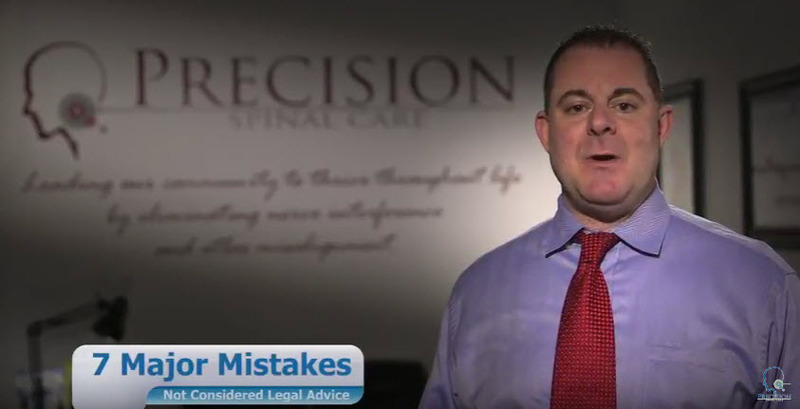 Precision Spinal Care is a trusted car accident chiropractic center in Chesapeake, VA. Regardless of the type of accident you were in or the severity of your injuries, we’ll be happy to discuss all your available treatment options with you. All patients receive our full attention during their appointments, and we want everyone to feel completely comfortable while at our office. We believe that many people could benefit from chiropractic care, and we’re always ready to answer any questions about the treatments we provide in Chesapeake. Don’t hesitate to contact Precision Spinal Care to make an appointment at our car accident chiropractic center.